The „Diagnostics-4-Future Conference“ is an international meeting-place for users and providers in diagnostics and adjacent fields. Based on questions in medical care, clinics and laboratories, innovative solutions for new diagnostics are discussed including research and development. The focus is also on solutions for rural areas (point-of-care). Organizer is the international competence network for diagnostics DiagNET that is funded by the Interreg V-Program. The discussed matters are highly user-oriented (physicians, clinicians, laboratories, medical centers). Medical needs and compatibility with user processes (clinical routine) are key factors for the conference. Especially, patient-oriented solutions regarding health-care in regional hospitals are addressed (e.g. point-of-care-testing). The conference connects partners from Europe with the 4-country region around Lake Constance (Germany, Switzerland, Austria & Liechtenstein). The conference brings together companies, laboratories, clinics, research institutions and health insurances / economists – in diagnostics and adjacent fields like pharma, biotech and medical technology. Sold out: The ‘Diagnostics-4-Future Conference’ got off to a flying start in November 2018 with around 160 participants from 8 countries. In a magnificent environment the conference organizers welcomed – companies, laboratories, physicians and researchers. 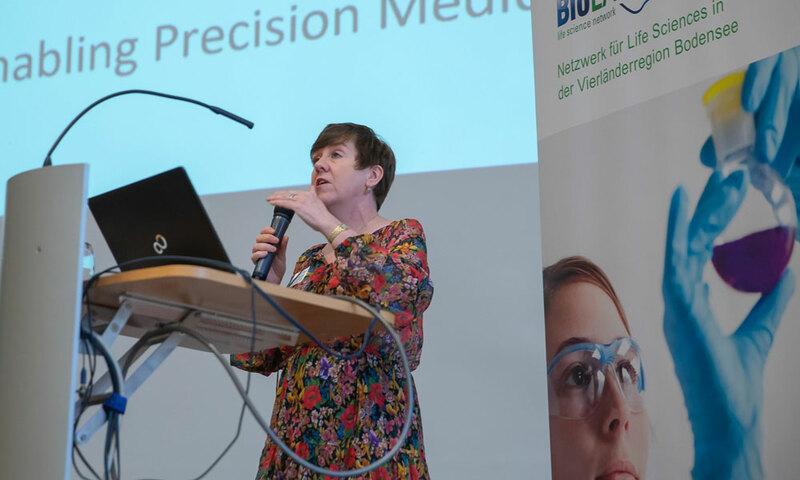 Highlights such as the keynote lecture on personalized cancer diagnostics by Professor Orla Sheils, Trinity College Dublin (IRL), demonstrated the high scientific level of the event. 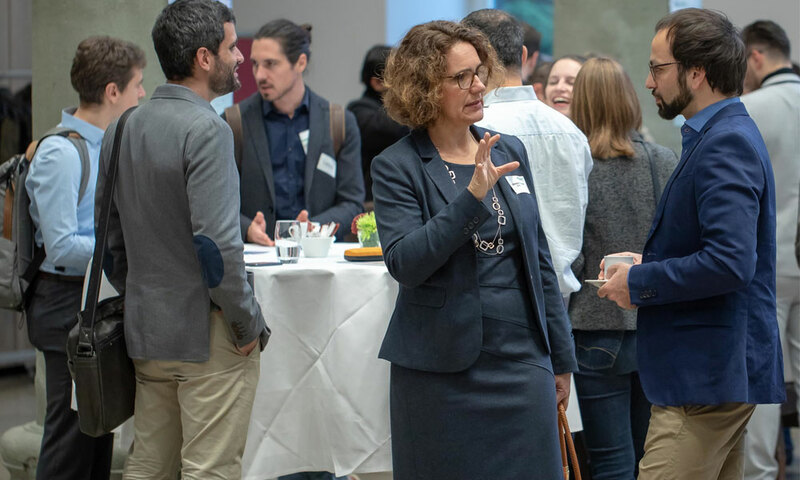 Networking leads to collaborations: The focus of the conference is all about networking: whether over lunch, during the coffee break or over a glass of wine, there were plenty of opportunities to explore possible collaborations. At the same time, the first were formally established. Glorious winners: Young researchers and start-up companies presented their innovations and product ideas in a poster session organized by the postgraduate school. 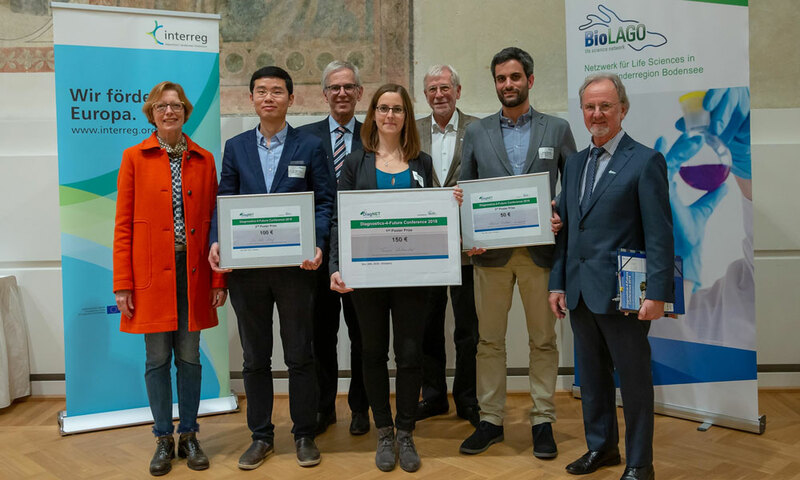 Prizes were awarded to scientists from Konstanz, Barcelona aswell Tübingen. 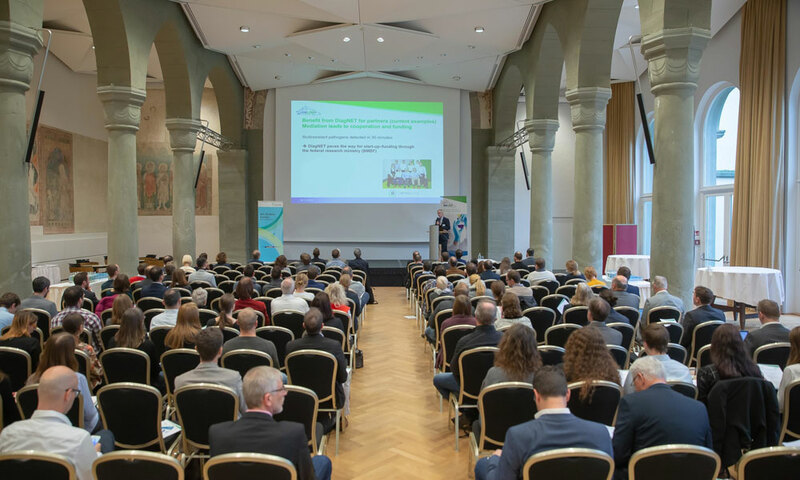 The „Diagnostics-4-Future Conference“ is part of the project „DiagNET – diagnostics of the future“ which is funded by the European Union from the European Regional Development Fund within the scope of the program „Interreg V Alpenrhein-Bodensee-Hochrhein„. The lead partner and funding recipient is BioLAGO e.V. Diagnostics of tuberculosis 2018 and beyond: how to win the battle over multi-drug-resistance? 12.30 The role of POC-testing to fight antibiotic resistance: what will be possible in 5 years from now? Fast and reliable MRE detection right from the swab – fiction, science or science fiction? 14.10 Fighting multi-resistant hospital pathogens in the Netherlands – a role model for Europe? Lifestyle biomarkers for personalized therapy: vision or reality? 17.10 Outlook: Diagnostics 2030 – What will be the role of multiplexed immunoassays? Take the chance to submit an abstract for the poster session to showcase your achievements to leaders and hidden champions in diagnostics from different European countries. Posters can present fundamental/applied science and technology, new products as well as innovations in clinical adoption.